Zambia is an incredibly beautiful country, with large open plains that stretch for miles. 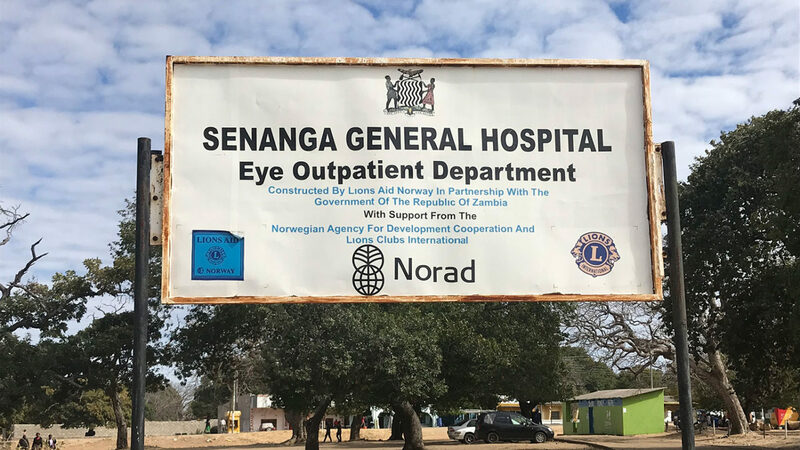 But for surgeons like Mr Ndalela, who you may have read about in our recent appeal, this can make it incredibly difficult to reach rural communities and provide eye care. 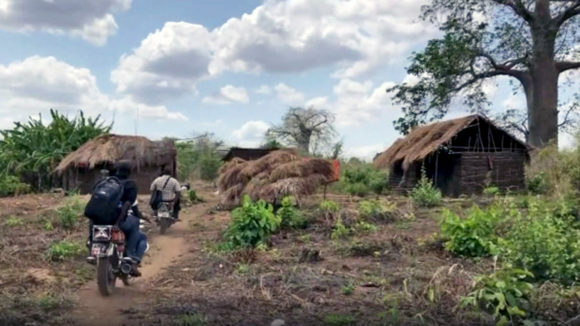 The sandy and windy conditions of the Zambian winter, combined with the lack of access to fresh water, can contribute to the threat of eye infections – and trachoma can be rife in these isolated communities. 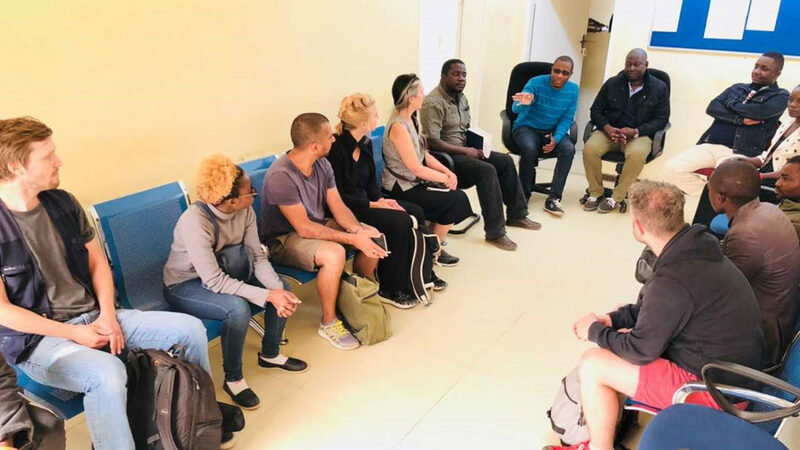 We began our first day in Zambia with a trip to Senanga General Hospital to meet the team who work tirelessly to save the sight of people in the western province of Zambia. As soon as our meeting was over, Mr Ndalela, the surgeon we were travelling with, ushered me into a side room to meet Mariah, who was suffering from advanced trachoma. Mariah was clearly in a lot of pain, so Ndalela decided to complete the operation there and then, and he began preparing for surgery straight away. 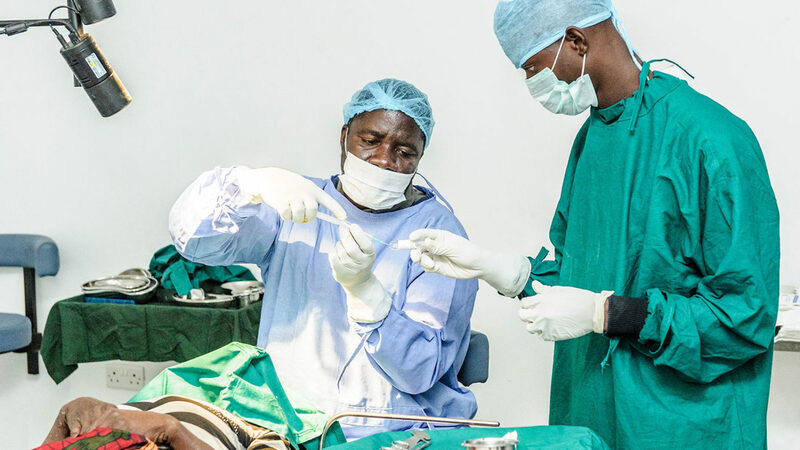 It was fascinating to witness the surgery up close, and it was impressive seeing him in action – I marvelled at how relaxed he was as he carried out his work with seamless ease. The operation only took half an hour: I was left in awe that such a straightforward solution can relieve such agonising pain. Sadly we didn’t get a chance to speak to Mariah after her operation, but one of our colleagues captured some images of her the following morning. The one below features our photographer, Jason, showing Mariah some of the pictures he took in the operating theatre. I’m saddened I didn’t get to witness this moment, but it’s amazing that Mariah was seeing and beaming from ear to ear less than 24 hours after her operation. That’s testament to the work Mr Ndalela is doing every day. After the operation, we set off for a rural village to see Mr Ndalela screen people for trachoma. We traveled on incredibly deep, sandy off-road tracks. Our car kept getting stuck and needed digging out, so it took two hours to travel just 25km. 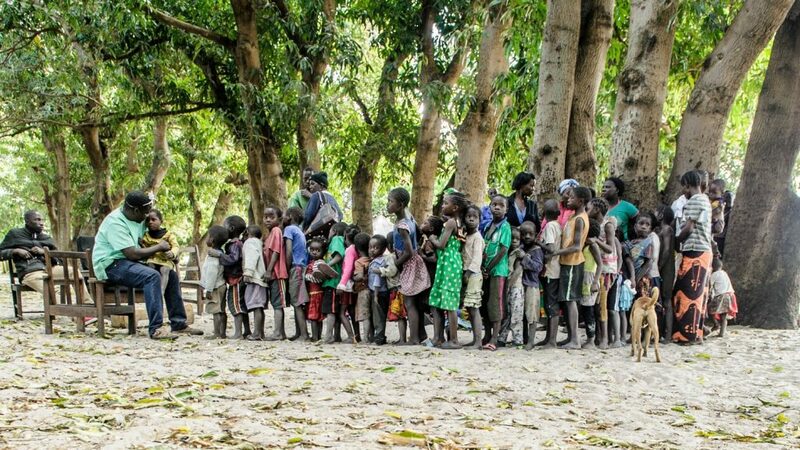 When we finally arrived in the village, Ndalela wasted no time in organising the children into lines so he could check their eyes. Screening someone for trachoma is a relatively quick process, and the children dealt with it really well given it must be an uncomfortable experience. The younger children would sometimes squirm and cry – I’m not fluent in Lozi, the local language, but a cry for your mother is universal in any language. During the screening, Mr Ndalela came across a two-year-old girl called Nalukena. She was clearly in a lot of pain and her eyes looked sore and red. 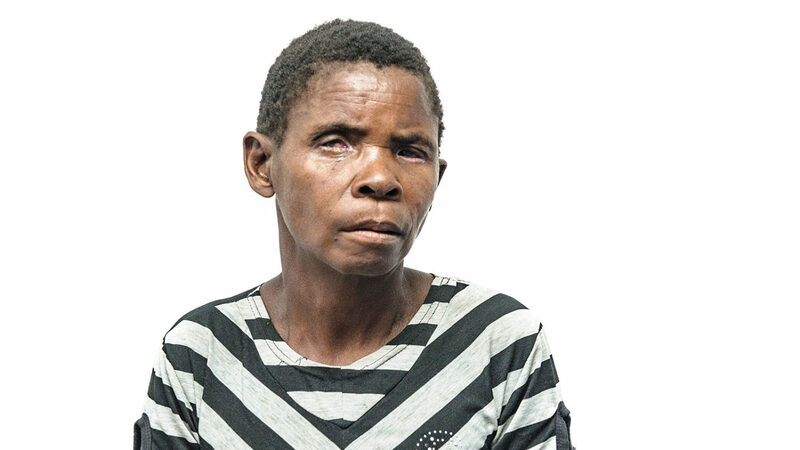 Mr Ndalela swiftly diagnosed her with severe trachoma, and wasted no time in giving her treatment that would fight the infection. We were then able to talk with her parents to see how the treatment would change all of their lives. Nalukena’s father told us: “The benefits will vary. As a family, our productivity will increase. 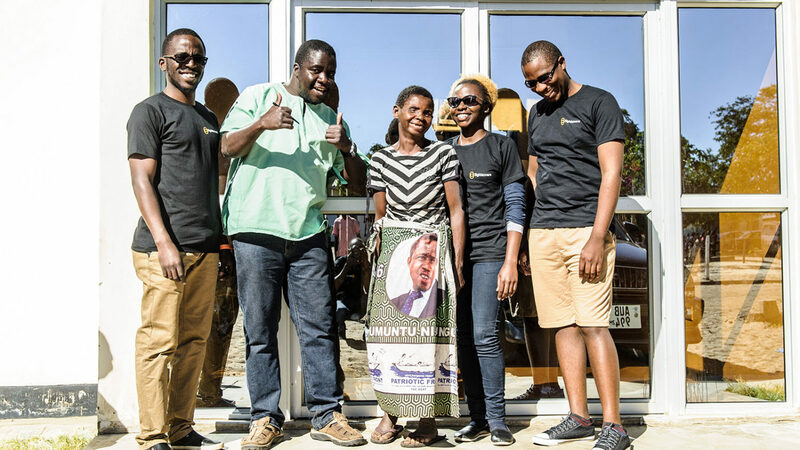 The nation will benefit because it’ll have an educated generation who can go to school and then go to work, and benefit the country.” And he went on to tell us of his hopes that Nalukena will be able to go to school and eventually become a doctor. 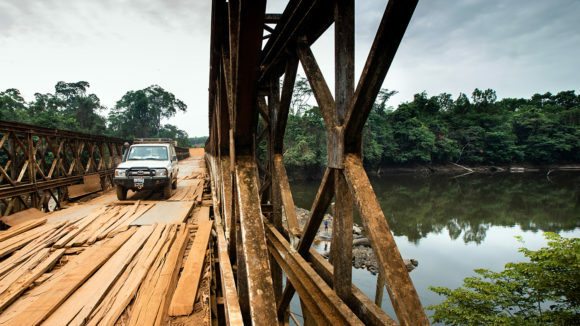 Shortly after meeting Nalukena, it was sadly time for us to leave the village, and we set off on the long drive, battling with the sand as our four-wheel-drive vehicles worked overtime. Mr Ndalela provided an amusing commentary as our driver, Lawrence, was getting to grips with the sand. To avoid sinking, we had to keep the pace up: as we raced down these tight windy sandy lanes, Mr Ndalela kept telling us we were “floating”. Once we were back on the tarmac, he praised Lawrence, telling him he was now ‘baptised’ on the sand. Zambia is a beautiful country, although people living in isolated, rural communities are still at risk from the threat of trachoma. 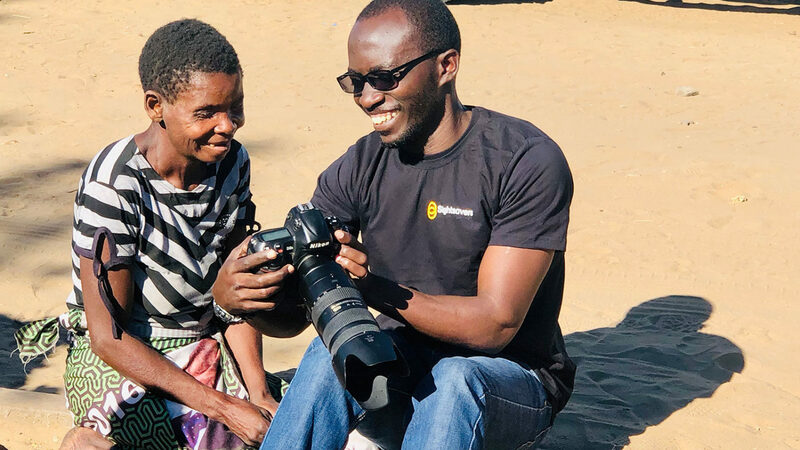 But as I left Nalukena’s village, I felt optimistic that thanks to the hard work of people like Mr Ndalela, supported by our generous donors, the end is in sight for trachoma in Zambia.